The Rev. 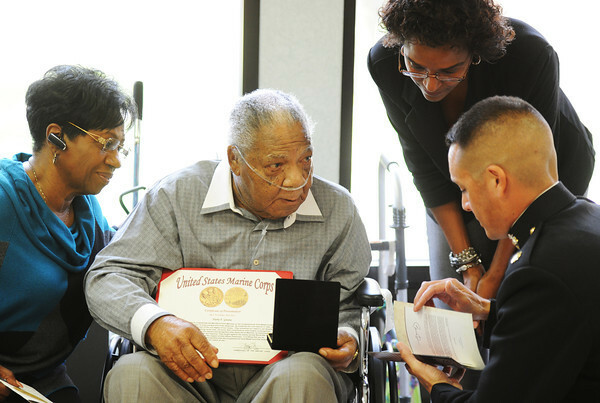 Harry F. Givens, center, is honored as a Montford Point Marine by Maj. Carl Martinez, inspector instructor for Weapons Company 3rd Batallion, 24th Marines, of Springfield, during a ceremony Friday morning, Nov. 2, 2012, at Spring River Christian Village in Joplin. Givens served as a Marine Corps corporal in the Pacific Theater during World War II from 1944-1946. Givens' wife Donna Givens, left, and Mayor Melodee Colbert-Kean look on.